This distinctive puffball is easily identified by its yellow-staining surfaces and its medium size (on the puffball scale of things). 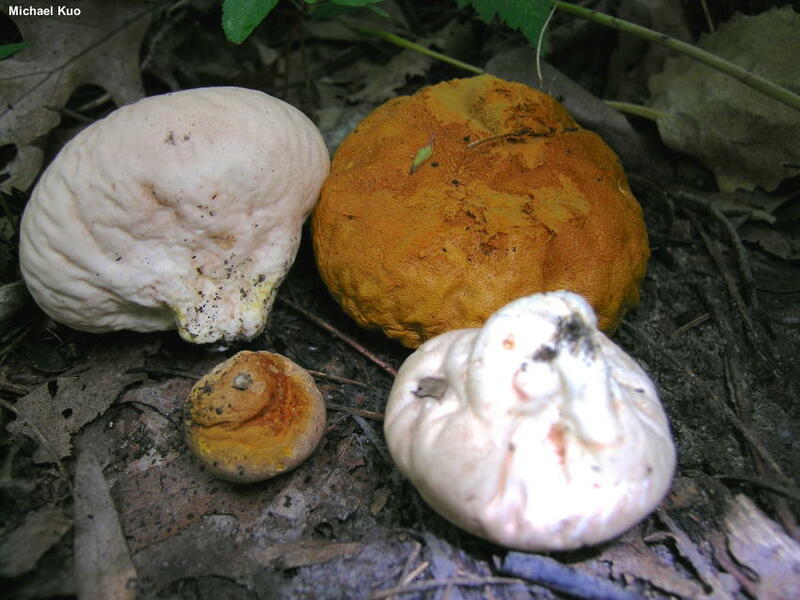 When fresh the surfaces of Calvatia rugosa stain reddish, then slowly yellow when bruised—and older specimens become orangish yellow overall. It is found across North America, but is much more common from the Great Plains eastward. While it is easily identified, however, it is not so easily named. Your North American field guide calls this species "Calvatia rubroflava." The name rubroflava ("reddish yellow") was first applied in 1885, and captures the distinctive color change of the species. But Reid (1977) placed the name rubroflava in synonymy with the older name rugosa (meaning "wrinkled")—a position later acknowledged by Kreisel (1992) and Bates (2004, 2009). But wait; there's more! 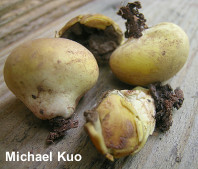 Bates points out that the original description of Calvatia rugosa calls for smooth spores, while the spores of specimens of "Calvatia rubroflava" have spiny spores. And (you should probably sit down for this one) the extent of the spininess is not consistently reported. Reid calls the spores "very minutely echinulate," but illustrates decidedly, dramatically spiny spores. Coker & Couch (1928) call the spores "very minutely rough, even under high power." Bates calls the spores "echinate," but Portman and collaborators (1997) call the spores "echinulate" (a diminutive form of echinate) and measure the spines at 0.83 µm long. (And, I almost forgot: Index Fungorum lists "Calvatia candida" as the proper name for the species described here.) Are there separate species involved? Or is the extent of the ornamentation variable? Tune in next time for another episode of Calvatia 90210 . . .
Ecology: Saprobic; growing alone, scattered, or gregariously in grassy areas; usually found in landscaped settings, but occasionally found in woods; summer and fall; widely reported in North America but much more common from the Great Plains eastward. The illustrated and described specimens are from Illinois, Missouri, and Colorado. 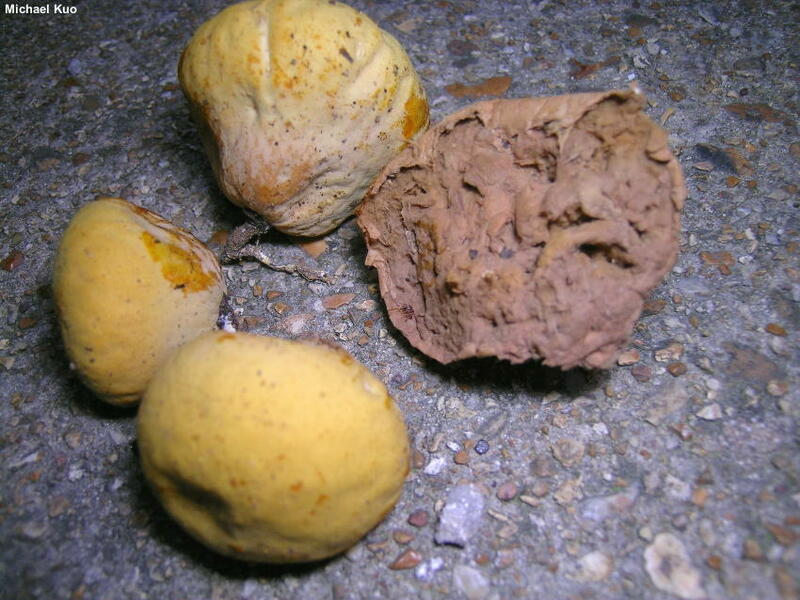 Fruiting Body: 3–8 cm across; up to 6 cm high; shaped more or less like a ball when young, becoming widely pear-shaped with maturity; developing broad wrinkles on the underside. Outer Surface: At first finely granular; becoming more or less bald; with a very thin, soft, papery "skin"; whitish to very pale tan when young and fresh, bruising pinkish and then yellow; becoming orangish yellow overall with age; the skin eventually sloughing away. Interior: White at first, becoming yellow when sliced; maturing to orangish brown; sterile base similar, small, hard to differentiate. Odor: Not distinctive when young; becoming foul and reminiscent of rotting meat with maturity. Spore Dust: Orangish brown to brown. 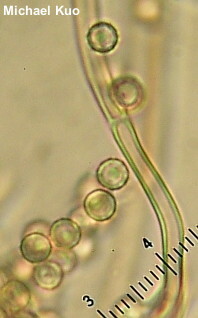 Microscopic Features: Spores 3–5 µm; globose to subglobose; finely echinate; without a tail; yellowish to brownish in KOH. Capillitial threads 3–4 µm wide; thick-walled; septate; yellowish in KOH; with scattered pores 1–2 µm wide. REFERENCES: (Berkeley & Curtis, 1868) Reid, 1977. (Saccardo, 1888; Coker & Couch, 1928; Zeller & Smith, 1964; Reid, 1977; Smith, Smith & Weber, 1981; Kreisel, 1992; Lincoff, 1992; Horn, Kay, and Abel, 1993; Kreisel, 1994; Bessette et al., 1995; Portman et al., 1997; Bates, 2004; Bates et al., 2009; Kuo & Methven, 2014.) Herb. Kuo 07250607, 08250601.